This entry was posted in English Literature and tagged Dorothy Richardson, James Joyce, May Sinclair, Modernism, Stream of consciousness, The Life and Death of Harriett Frean, Virago Modern Classics by Simon Lavery. Bookmark the permalink. It takes no time to read but is very rewarding- I think you’d like it. Gosh, I read this so many years ago and haven’t revisited it. I think I should! It’s like Christmas is already back: a book that seems to be totally up my street, two sites…I’m a great fan of these literary societies (especially the Anthony Powell society). I don’t know about rugby players being bigger than they used to be, but now that they are professionals they are certainly well-honed ! Anyway, after dominating the match most of the time, the French lost by one measly point. Trinh-Duc unfortunately missed a very important penalty, which may have cost us the match. I’ve been wondering, Simon, would Cornish people support the English team or a Celtic team ? Because for us, French people, the enemy is the English(it’s not for nothing that we call the match between us “the crunch”). We will support the Irish or the Scots or the Welsh when we’re not involved. Though I really loved Wilko ! Cornish May well support Ireland or Wales as fellow Celts; France if they have Bretons in the team! There’s a strong tradition of rugby here in the southwest. So glad you wrote about this book: it is an extraordinary work. 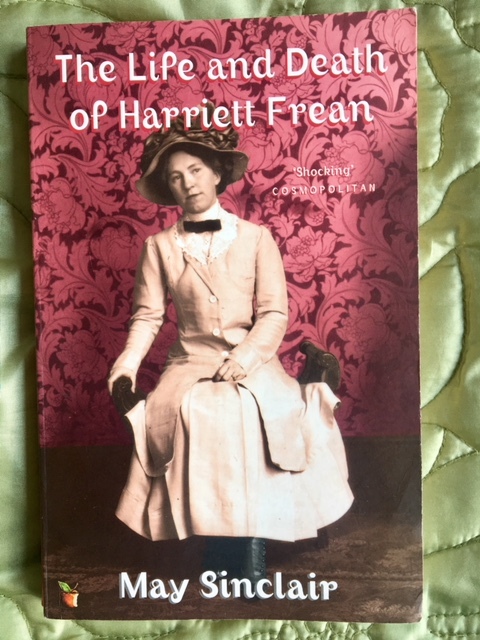 I can’t say I loved it, it was too sad, and Harriett was such a self-destroying woman in her quiet way. But I did think it was very well-written and completely engrossing and convincing. Agatha Christie said that May Sinclair was a huge influence on her, perhaps surprisingly, and in my blogpost on this book, I wrote about the ways that I could see that that had worked. Jonathan Coe – another author I really like – wrote very interestingly about Harriett Frean. Thanks, Moira, for the information about A Christie – an influence I wouldn’t have deduced. I’ll take a look at your post. Also for the J. Coe point – do you have a link or title? Moira: just read your post about Christie and Sinclair, and see the link there to J Coe – thanks again! Will return to this Simon! Will definitely check out the “May Sinclair Society.” So many women writers labored in obscurity, wonderful to shine the light on them in (somewhat*) more enlightened times. Another way of thinking about his somewhat circular reasoning is that women make less than men not due to the fact that, they must not be “worth” more, since the market pays them less than men. Women earn less than men due to the fact that the market pays them less, which proves that they are worth less, otherwise they would earn more.